The CDR is an unbiased and authoritative guide to more than 11,000 prescription and over-the-counter drugs. Medical experts have worked with the United States Pharmacopeia to update this year's edition and add information on the newest drugs. Unlike other drug references, the CDR relies solely on medical experts for its facts, not on drug companies' package inserts. In clear and easy-to-understand language, the CDR explains what you need to know about each drug's indications, interactions with food and other drugs, and side effects. Color charts help you identify the most common pills and tablets. 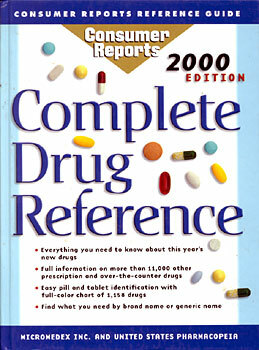 Complete Drug Reference 2000 is published by Consumer Reports, a division of Consumers Union of U.S.Inc, in conjunction with the United States Pharmacopeia (USP) and Micromedex - organizations that have years of experience in bringing you health information. Consumers Union is an independent and nonprofit organization established in 1936 to provide consumers with information and advice on products, services, health, and personal finance. Micromedex is a leading provider of health and safety databases for more than 8,000 facilities in 90 countries. The not-for-profit USP has for many years set official standards for medical products in the United States.